Welcome to the club!! !……so what’s next? We recognize that beginning and continuing an exercise program can be a potentially overwhelming proposition without some guidance when it comes to knowing where to begin and also what the structure of your workouts should consist of. We want to help eliminate the guess work for you and in lieu of that, all new members are entitled to two complimentary one hour appointments with one of our Certified Personal Trainers so that your journey towards creating a healthier YOU gets off on the right track. Think of this this appointment as developing the roadmap for your health and wellness experience here at the club. 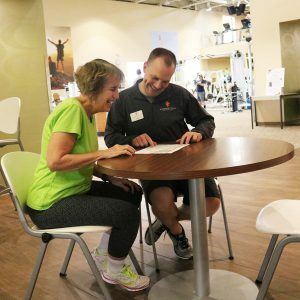 In this first appointment, you and your trainer will begin by reviewing your past and current medical history, current and past experiences with exercise, discuss and set realistic goals you wish to obtain as well as discuss group exercise classes that would be a potential compliment to your individual exercise routine. Finally, this session will conclude with a total body movement assessment screening performed by your Trainer. This screening will help identify any movement dysfunction that may be occurring in your body which could be leading to pain/injuries, limiting performance and/or potentially just making any of life’s basic tasks challenging. By improving the way you move, you will improve your bodies overall function! In your second appointment you will have the opportunity, if you desire, to have your baseline body composition assessment done with our state of the art InBody 570 machine. 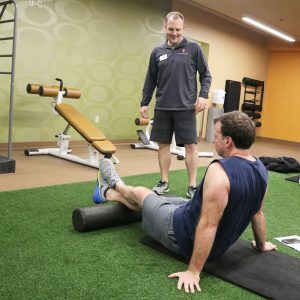 This baseline data, along with the results of your movement assessment from your first appointment, will provide you and your trainer with key metrics that will be influential in developing your initial exercise prescription as well as giving you objective data points to compare against in the future to help assess progress. You can find more info on our InBody assessment here. Next, you will review the results of your movement assessment from appointment #1 and discuss what impact any imbalances that are found may be having on your everyday functionality. 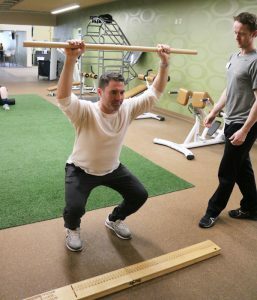 Your Trainer will then prescribe appropriate and customized corrective exercises to help correct any imbalance(s) that were uncovered during the movement assessment. These corrective exercises that your Trainer will provide you with may include stretching and/or strengthening movements and will be the foundation for moving on to subsequent cardiovascular and strength training which your Trainer will discuss with you as well. You will leave this appointment with an individualized basic plan for you to take with you to work on when you come into the club to work out. Studies show that when you have an individualized plan you are more likely to stick to it and it will make sure that you are allocating your precious time here at the club on the things that are most important to YOUR individualized needs.